Time to get productive? Just grab the S Pen and you can jot down notes from your meeting or lecture. It feels like a real pen, so you can take handwritten notes without carrying paper around with you. And you can even use it as a stylus or drawing tool. The S Pen doesn't need charging, so you can use it whenever you like without worrying about powering up. Get your hands on the first Galaxy tablet with Adaptive Fast Charging. It means you won't have to wait around for ages to charge up. And it'll stop charging once your tablet is powered up, to prolong the life of your battery. If you're out and about all day, you don't have to worry about it running out of juice either. It has a longer battery standby time with up to 12 hours of video playback, so you can keep going for longer. 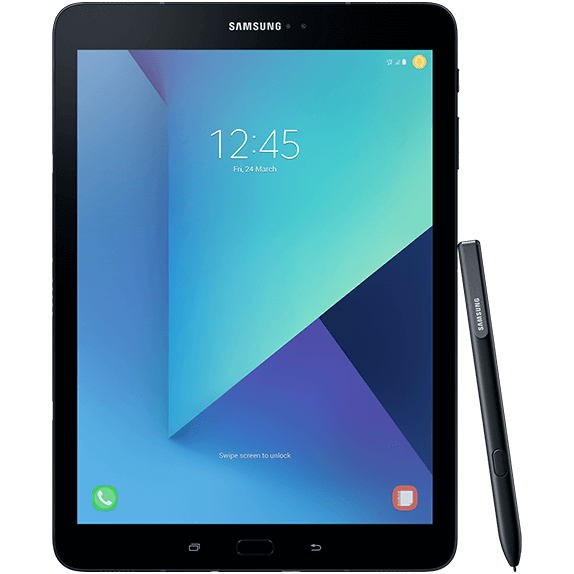 If you're a movie buff or an expert gamer, then the Galaxy Tab S3 is ideal. It's got a 9.7 inch Super AMOLED display, making films and games crystal clear. And it supports HDR video, so you can enjoy videos with richer colours and see the hidden details in dark scenes. Its AKG quad speakers will keep the sound free from distortions too. So whether you're commuting on the train, sat in a waiting room or winding down on your lunch break, you can just zone out and immerse yourself in music, movies or games. The Galaxy Tab S3 is versatile, with up to 256GB of expandable memory. So whether you want more room for your apps, games, photos or movies, just pop in a MicroSD memory card and do more of what you love.